Solar-powered warning signs have been installed in the North York Moors National Park in a bid to cut the number of sheep killed on the roads. Last year, 239 sheep and lambs died on open moor roads in the park after being hit by vehicles. The signs are being trialled on two main roads and sheep deaths will be monitored to see if the signs make a difference. They will only be in place from April to October when lambs are on the moors. The signs, which have been funded by North Yorkshire County Council, have been installed on the Blakey Road between Hutton le Hole and Castleton and on the road between Rosedale and Ralph Cross. 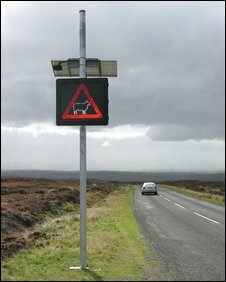 They flash with two images: a sheep warning triangle followed by 'Slow Down' and are activated when a vehicle travels over a certain speed. Rachel Pickering, the National Park Authority's moorland and estate officer, said: "We appreciate that some people may find the signs intrusive, but sheep deaths and injuries are very distressing and also costly for the moorland farmers. "Collisions can also damage vehicles and cause injuries for any motorists involved. "The signs have been located at accident black spots, in consultation with the farmers affected, but we have tried to minimise the signs' impact on the landscape as much as possible."